Frozen probably isn’t the first thing that comes to mind when the flight attendant sets a hot and steamy meal on the tray in front of you. But it’s actually part of the secret of how LSG Sky Chefs keeps some of its finest ingredients tasting fresh. 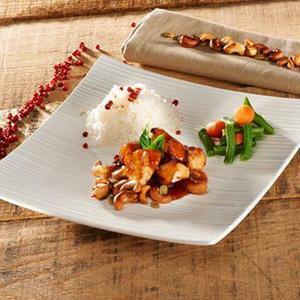 Given its nearly 20 years of experience in preparing frozen dishes for the airline industry, the company has perfected the science of creating authentic, tailor-made menus that showcase our worldwide culinary expertise – and there are over 900 different dishes representing 100 ethnic varieties to choose from! LSG Sky Chefs is the only global provider of frozen airline meals offering products that can complement or replace traditional catering solutions, such as meal concepts for complimentary services, Buy-on-Board, take-away snacks and food components. With production facilities in Alzey, Germany, Pittsburgh, PA (USA) and Qingdao, China, LSG Sky Chefs can deliver all around the world. At this year’s WTCE, we are excited to present our competences in this area and will invite visitors to sample our wide variety of fresh-tasting frozen entrees. In addition, guests can enjoy a unique display of sculpted ice skyscrapers, which serve to remind them that frozen always has a fresher side.